This is a W.E. 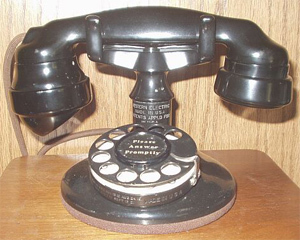 set first known as the D76869, but later named the "A" Handset Mounting. It was the first widely circulated deskset offered by the Bell System, enabling subscribers to use a one-piece handset and thereby have a hand free while talking. It was built upon the base of the 51AL candlestick. In its early existence, it was issued with a special 2E or 2G dial, but later issued with a newly designed dial, a 2H. This set was followed by another round base phone, the WE 102 or "B" Handset Mounting.